The Cube 802 housing is a cube-shaped pc case for users who love innovation. The uncomplicated design in classic black with three tempered glass windows is equipped with RGB lighting. There are four front and one rear AZZA Hurricane II DualRing digital RGB fan installed. 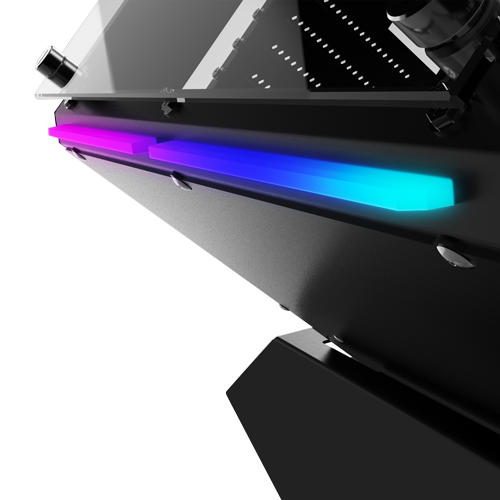 For this purpose, three RGB strips are attached, which emphasize the lighting even more. These can be controlled via the two included RF remote controls; via Aura Sync on your motherboard more components can be synchronized. Anyone who thinks he only gets a box with light is very wrong. The Cube 802 is fully functional. The Cube 802 can use graphics cards up to 280mm and water cooling up to 240mm at the front. Due to the dual-chamber concept components don’t heat each other. The power supply is in a separate compartment on the ground space. This also reduces the background noise considerably. The Cube 820F is divided into two chambers, separating the power supply and hard drives from the rest of the components. CPU coolers are limited to a height of 165 millimeters. For expansion cards, 280 millimeters are available in length. Recently, AMD launched four second-gen Ryzen models: the Ryzen 5 2600, the Ryzen 5 2600X, the Ryzen 7 2700, and the Ryzen 7 2700X. These new CPUs are based on Zen+ architecture, which is a refresh of the Zen architecture used on the first-gen Ryzen CPUs. This architecture uses a new manufacturing process of 12 nm (first-gen Zen architecture uses a 14 nm process,) which allows higher clocks. The new architecture also brings optimizations such as lower cache latencies and advances on the SenseMI technology, which controls the clock rate based on CPU load, temperatures, and other factors. Keep in mind, however, that it is not the “Zen 2” architecture, which will be launched in 2019 with a 7 nm manufacturing process. These new models are compatible with the AM4 motherboards launched last year, with the first Ryzen CPUs. AMD released a new chipset, X470, so there are new motherboard on the market, but “old” motherboard (based on X370, B350, and A320 chipsets) and new ones (based on X470) are compatible with both first-gen and second-gen Ryzen models. However, it may be needed to update BIOS on older motherboards in order to support the recent CPUs. When we compared it to its competitor, the Core i7-8700K, we have the same scenario we saw on the first generation: the AMD model is faster on some applications, mostly in tasks that use all the threads, like video and image rendering, and slower in other ones, mostly games. MSI X470 Gaming Plus, Form factor: ATX • Chipset: AMD X470 • RAM: 4x DDR4 DIMM, dual PC4-27733U/​DDR4-3466 (OC), max. 64GB (UDIMM) • Extension slots: 2x PCIe 3.0 x16 (1x x16, 1x x8), 1x PCIe 2.0 x16 (x4), 3x PCIe 2.0 x1, 1x M.2/​M-Key (PCIe 3.0 x4, 22110/​2280/​2260/​2242), 1x M.2/​M-Key (PCIe 2.0 x4/​SATA, 2280/​2260/​2242) • External connectors: 1x DVI-D, 1x HDMI 1.4, 2x USB-A 3.1 (ASM1143), 4x USB-A 3.0, 2x USB-A 2.0, 1x Gb LAN (Realtek RTL8111H), 5x jack, 1x toslink, 1x PS/​2 Combo • Internal connectors: 4x USB 3.0, 4x USB 2.0, 6x SATA 6Gb/s (X470), 1x serial, 1x parallel, 1x TPM-Header • Header Cooling: 1x CPU fan 4-Pin, 4x fan 4-Pin, 1x pump 4-Pin • Header Lighting: 1x RGB-Header 4-Pin (5050) • buttons/​Switches: clear CMOS • Audio: 7.1 (Realtek ALC892) • RAID level: 0/​1/​10 (X470) • Multi-GPU: AMD 3-Way-CrossFireX • power connections: 1x 24-Pin ATX, 1x 8-Pin EPS12V, 1x 4-Pin ATX12V • Graphics: IGP (via CPU/​APU) • Lighting: RGB, 1 zone (page right) • Special features: audio+solid capacitors • Warranty: three years • Note: motherboard certified for HDMI 1.4. HDMI 2.0 possible with Ryzen 2000 and higher. There are plenty of premium X470 boards out there if you need some of the additional testing and overclocking tools or features such as Wi-Fi, but if you just want to get up and running quickly for as little cash as possible, then some of the cheaper X470 boards such as the MSI X470 Gaming Plus are definitely worth a look. You're getting many of the basics - eight-channel audio with an optical output, decent-size VRM heatsinks, RGB LED headers, and enough fan headers to power up to six fans including one dedicated for AIO liquid-cooler pumps. It's fairly low-key as far as lighting and aesthetics go, and unlike its more expensive siblings there's no I/O port cover either. Surprisingly, though, MSI has managed to cram in an 11-phase power design, and there's even a CMOS clear switch at the base of the board, which is arguably one of the more useful overclocking and testing tools, especially if you're pushing the limits of memory speed and overclocking on AMD motherboards. For the most part there's not much difference between AMD boards these days, and most of our benchmarks are evidence of that. HandBrake, PCMark 10, and Cinebench all have next to no performance difference between the handful of X470 boards we've tested so far, and the same was true in our game tests and indeed the storage tests too. Bashing a cheap motherboard for lacking features or not being particularly attractive is usually a pointless exercise, as what most people in this price range are concerned with are stability and ease of use, and here the X470 Gaming Plus performs well and also overclocked to the same levels as much more expensive boards. G.Skill RipJaws V black DIMM Kit 32GB, DDR4-3200, CL16-18-18-38, Typ DDR4 DIMM 288-Pin, Module 2x 16GB, JEDEC PC4-25600U, CAS Latency CL16 ( ~10.00ns), Row-to-Column Delay tRCD18 ( ~11.25ns), Row Precharge Time tRP18 ( ~11.25ns), Active-to-Precharge Time tRAS38 ( ~23.75ns), 1.35V, Heatspreader, Intel XMP 2.0, Sensor. As the latest addition to the classic Ripjaws family, Ripjaws V series is the newest dual-channel DDR4 memory designed for maximum compatibility and cutting-edge performance with the latest Intel Core processors. Built with the finest components, tested under the most rigorous conditions, and offered in five color options, Ripjaws V is the perfect choice for building a new performance system or for a simple memory upgrade. Available in a wide range of frequency options from standard DDR4-2133MHz to a blistering DDR4-4000MHz, Ripjaws V lets you enjoy a faster computing experience for gaming, video & image editing, rendering, and data processing. Each and every Ripjaws V DDR4 memory kit is tested with G.SKILL’s rigorous validation process on all major performance motherboard brands to ensure the best-in-class reliability and compatibility across the widest selection of motherboards. But that's not enough: The memory modules are illuminated with a RGB memory cover for DDR4 memory modules. 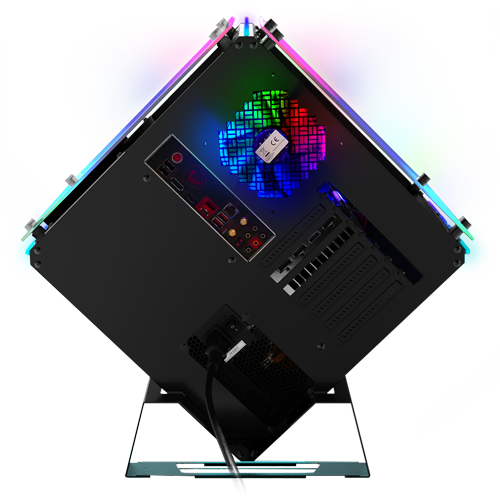 A total of 36 addressable LEDs with 16.8 million colors controlled by the patented TT RGB PLUS software and / or synchronized with MSI's motherboard RGB software. The GeForce RTX 2080 Ti will be a high-end graphics card by NVIDIA. Built on the 12 nm process, and based on the TU102 graphics processor, in its TU102-300A-K1-A1 variant, the card supports DirectX 12.0. The TU102 graphics processor is a large chip with a die area of 754 mm² and 18,600 million transistors. Unlike the fully unlocked TITAN RTX, which uses the same GPU but has all 4608 shaders enabled, NVIDIA has disabled some shading units on the GeForce RTX 2080 Ti to reach the product's target shader count. It features 4352 shading units, 272 texture mapping units and 88 ROPs. Also included are 544 tensor cores which help improve the speed of machine learning applications. Also included are 68 raytracing acceleration cores. NVIDIA has placed 11,264 MB GDDR6 memory on the card, which are connected using a 352-bit memory interface. The GPU is operating at a frequency of 1350 MHz, which can be boosted up to 1545 MHz, memory is running at 1750 MHz. Being a dual-slot card, the NVIDIA GeForce RTX 2080 Ti draws power from 2x 8-pin power connectors, with power draw rated at 250 W maximum. Display outputs include: 1x HDMI, 3x DisplayPort, 1x USB Type-C. GeForce RTX 2080 Ti is connected to the rest of the system using a PCI-Express 3.0 x16 interface. The card measures 267 mm in length, and features a dual-slot cooling solution. So, how much better is the new Samsung SSD 860 EVO series over the Samsung SSD 850 EVO series when the SATA 6Gb/s interface has been holding back performance for years? Peak performance numbers have not changed much as the 860 EVO is rated as having up to up to 550 MB/s sequential read and up to 520 MB/s sequential write speeds. The old 850 EVO series had read/write speeds of up to 540/520 MB/s, so there is just a slight performance bump there. 4K QD32 Random read/write speeds remain exactly the same at to 98,000 IOPS read and 90,000 IOPS write. No optical disc drive in the system! Ich benutze den PC natürlich fürs gaming. Empfehlung gehen an alle die die selben Schwierigkeiten haben sich zu entscheiden wo man am besten ein pc kauft. Qualität ist einfach super. Ich benutze den Pc hauptsächlich zum Spielen und ich muss sagen alles läuft super auf höchsten Einstellung. Ich kann den Pc nur weiterempfehlen!